Sometimes the edge of your toenail will grow into the soft tissue on the side of your toe, especially if you wear tight fitting shoes like pumps or cowboy boots that force your toes together. Ingrown toenails can be extremely painful and often lead to a serious fungal toenail or bacterial infection. 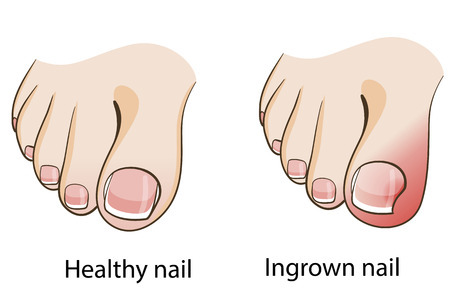 The obvious symptoms of an ingrown toenail include pain, redness, swelling and oozing at the edge of the nail where it penetrates the skin. Soaking and resting—An ingrown toenail will often improve with warm water foot soaks and foot elevation. Edge lifting—Prying up the edge of the nail and inserting a small piece of cotton can redirect the nail to grow over your skin instead of into it. Minor surgery—More severe ingrown toenails may require surgical treatment by your podiatrist that is done with a local anesthetic on an outpatient basis. Always cut your toenails straight across rather than on a curve, and not too short. This prevents the nail from growing into the skin in the first place. Wear shoes that fit properly and not too tight or too loose. If you are experiencing painful ingrown toenails, see your foot doctor for the proper diagnosis and treatment. At Family Foot & Ankle Clinic, Dr. Stephen Markantone treats a wide variety of foot and ankle conditions including sports injuries, diabetic foot issues, pediatric foot conditions, toe and foot deformities, fungal infections, and heel problems. Equipped with the most advanced technologies and a dedicated staff, Family Foot & Ankle Clinic provides individualized and high-quality care for patients in the North Versailles and Delmont, PA areas. Contact our North Versailles office at 412-824-9370 or our Delmont office at 724-733-3338 to schedule an appointment.